Knitting needles have evolved through centuries of hand-knitting. Before interchangeable knitting needles came into the picture, we only knew of three basic types. Quickly, these are single-pointed needles, double-pointed ones, and circular needles. They’re still very much around these days, but interchangeables have definitely made their own mark in the knitting world. What are interchangeable knitting needles? Interchangeable knitting needles have the look and function of circular knitting needles – two pointy needles joined together by a flexible tube or cable. Or you may also think about it as a single needle with two pointed ends and a bendy middle. Like circular needles, the interchangeable version is used when knitting in the round. They’re also useful when doing large flat patterns. The cable makes it possible to do longer and heavier projects without crowding the whole length of the needle tips. This makes it easier on the wrist because the weight of the project rests on the knitter’s lap. The difference is in “interchangeable.” A set usually comes intact in a case with neat rows of needles of various diameters and cables of different lengths. The needles and cables can be mixed and matched to construct as many circular knitting needles as the number of parts will allow. Why should you invest in interchangeable knitting needles? What’s really neat with interchangeable knitting needle tips and cables is that you get multiple combinations in a set. If your set has 7 pairs of needles and 4 cable lengths, for instance, that’s equivalent to 28 combinations. That’s important when projects require a particular needle size and a particular needle length, which is usually the case when knitting in the round. Instead of stacking on all needle sizes and types, be practical and get a set of interchangeable knitting tips and cables. This way, you’re able to use the best combination of cord length and needle diameter that your project calls for. It’s about greater flexibility, reduced cost, and less clutter. How do you choose the best interchangeable knitting needle set? The choices can be quite overwhelming, but the key lies in what kind of a knitter you are. What works best for you may not work for other knitters, and vice versa. What type of knitting projects do you mostly do? Answer these questions as you go through each of the important features, which we will discuss in a bit. What features must a buyer know before choosing an interchangeable knitting needle set? You’ll find them in bamboo, wood, steel, nickel-plated brass, carbon fiber, aluminum, or plastic. The more lightweight materials like plastic, wood, and bamboo make for very wrist-friendly needles, while steel and other metallic needles are prized for their durability. Needles made of aluminum and carbon fiber combine lightness and durability and are preferred for bigger and heavier projects. What’s your personal preference? Wood and bamboo have a nice warm feel to them which most knitters are particular about. They don’t make clinking sounds which metallic needles do. On the other hand, steel can be slicker than wood, and that can spell the difference if you need speed. Most metallic needles have sharp tips while wood and bamboo tend to be duller, though not necessarily so. Like we said, it’s what’s important to you. If you do more of fine knitting and lacework, then you should pick needles with pointy tips. If you’re a beginner who tends to push on your stitches, then choose needles with more rounded tips. Pick sets with at least 6 pairs of needles in different diameters to allow for versatility. Again, what do you mostly do? If you rarely do bulky patterns, then you won’t have much need for large needles. Important note: The sizes of the needle diameter range from 2 mm to 25 mm. US sizing assigns increasing numbers (0 to 50) for this increasing diameter range. Take note, however, that British sizes are quite the opposite. The size range decreases (14 to 000) as the diameter increases. Interestingly, 4.5-mm diameter is size 7 in both US and British sizing. Cord lengths range from 30-150 centimeters. What’s the usual circumference for one of your projects? Choose a set that will allow you a variety of lengths, but make sure that the set includes the cord lengths you frequently use. As a rule of thumb, always use a cable that’s shorter than your project when knitting in the round. For example, a 60-cm cable will work for a sweater that’s 80-cm around the chest. Also remember that when knitting flat, the cable (minus the length of the needle tips) can hold only up to 3 times its width of knitted material. Important note: The length of cable indicated in most sets refers to the combined length of the cable plus the needle tips. If this isn’t clearly stated, ask the supplier about it or find out from previous questions or reviews. Interchangeable knitting needle cables are usually connected using a screw-like link. Cord keys are also commonly used to secure needles to the cables. Important note: Find out about the mechanism used to connect the needle tips to the cable. They have to be smooth to avoid snags. Also find out about how secure the links are. Connectors that constantly undo are a major nuisance. These accessories are important. End caps are used to prevent your stitches from slipping off when you need to take a break. Stitch markers are attached at the beginning of a round or certain points in your pattern, such as, where you want to increase or decrease the number of stitches. Organizing your knitting items is a breeze with a compact case, so you also have to know about how handy and well-designed the kit is. Important note: See if these accessories are included in the set or if they’re sold separately. 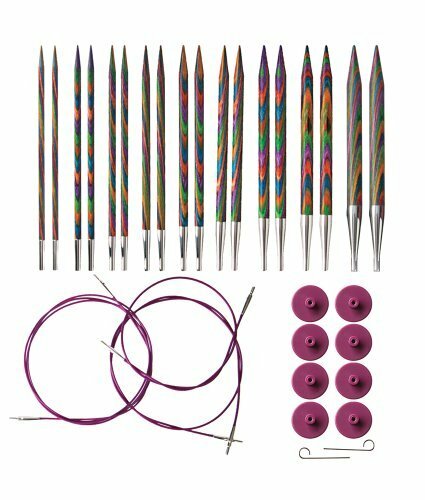 We’ve picked our top interchangeable knitting needle sets from a multitude of choices available. See for yourself how each of these products stood out from the crowd. ChiaoGoo Twist Red Lace Interchangeables set offers an unbelievable choice of needle tips – 13 pairs in total. This is a complete set of all the sizes within the range 2-15 (US sizing). The smallest diameter, 2.75 mm, is great for intricate patterns while the chunkier needles are best for bulkier projects. All needles are fine-tipped and made of steel. There are 3 cable lengths provided – 60 cm (24”), 80 cm (32”), and 100 cm (40”). 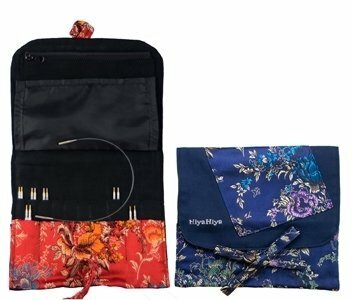 The accessories include 2 cable connectors, 4 end stoppers, 2 cord keys, stitch markers, and a fabric kit for storage. 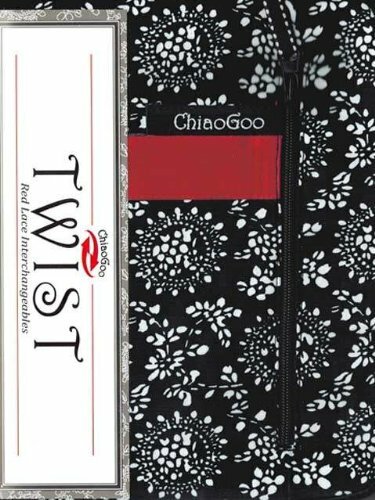 Buying a ChiaoGoo Twist set is like having 39 circular knitting needles, plus the ability to switch needle tips on the fly. The tips are sharp and delicately tapered. We find the needle surface has the right amount of slip but not overly so. The no-memory cords are soft, flexible, and don’t twist at all. Another very important feature is the almost seamless join. The needle’s base is inserted into the cord’s end and locked in place. Stitches glide through without catching or need to push or tug. You can work your magic loops with nary a hitch. The fabric kit is nice and neat with slots for extra needles or scissors. Whether you’re an expert or novice knitter, we believe this set will be very valuable. 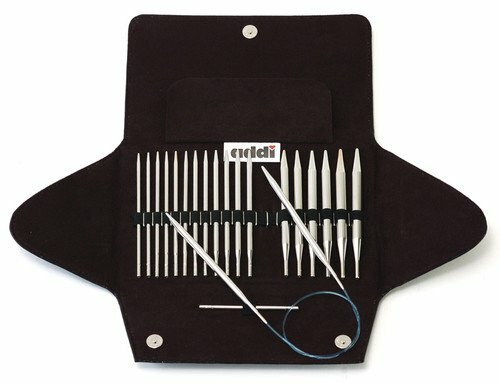 This Addi set includes 10 nickel-plated brass needle tips. It has a good selection of sizes that run from 4-15 (US sizing). The smallest diameter measures 3.5 mm and is commonly used with 4-ply yarns in a variety of projects. A connector piece is included for holding stitches or for joining cables together. There are three blue cables in 24”, 32”, and 40” lengths. While ChiaoGoo Twists have pointy tips, Addi Clicks are blunt. Some knitters will tell you that needle tips should always be sharp, regardless of the project. Others, however, solely use sharp tips for lacework or patterns that use a lot of k3togs and similarly complex techniques. For the rest, they prefer more rounded and slick tips like Addi, especially if they’re the type of knitters who tend to push on their stitches. It’s purely a matter of preference so you can’t really say that sharp tips are superior to blunt ones. The blue cord is durable and flexible, but curls especially when knitting small circumferences. The join between needles and cord is secured by a twist-and-click locking mechanism. The connection holds fairly well, but there’s a noticeable bump over it. Thick yarns glide smoothly although this can be an issue for thinner yarns. Addi Clicks is obviously compatible for thicker yarns so we won’t count that against it. Clover Takumi combo set comes close to ChiaoGoo Twist in terms of the number of needle sizes it has. The kit includes 12 pairs of needle tips from 3-15 US sizes. The range of selection is a lot wider than ChiaoGoo, though, because this kit has 5 different cord lengths. That means you’d get 60 combinations of diameters and lengths to assemble circular needles, and that’s a lot! 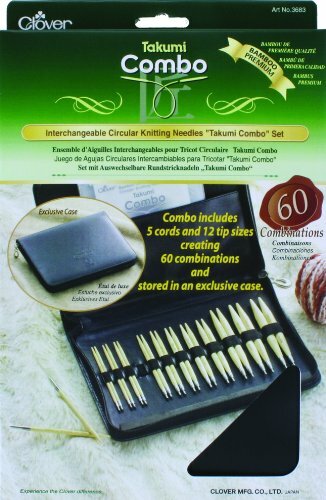 The needle tips are made of Takumi bamboo, which is popular to knitters for its warm and natural feel. Bamboo adjusts to the knitter’s body temp and is perfect for sensitive or clammy hands. It’s as light as wood but much sturdier. These qualities make Clover Takumi needles a great option for knitters. All these needles and cables are kept in a pocket-size zippered case for added convenience. But what’s quantity if you’re not satisfied with quality? Starting from the tip, we find it nicely tapered – not so sharp and not so blunt. The needle has a silky surface that lets the knits and purls glide smoothly, but not as slick as most metals. If you want your needles to have a slight grip to the yarn then you can’t have it better than this. Well, again, that’s a matter of choice. If you want speed, then you’d better get the slicker metals. You might want to know that this set includes a 16” cable. The other sets don’t have it this short. The metal joins are snag-free. That’s good to know because snagging is a major concern for knitters. One possible weakness is that after hours of knitting, the connection loosens. That may not be totally bad. There’s enough thread in the join to give you fair warning before it completely unscrews, so there’s no reason to panic when and if that happens. If you’d ever opt for this kit, keep in mind that it needs tightening every now and then. Our list for the best interchangeable needles wouldn’t be complete without a set made of wood. We think that this item from Knit Picks offers great value for money with 9 pairs of tips in sizes that range from 4 through 11 (US sizing). Two cables are included for each length of 24” and 32”, making 18 circular knitting combinations for the whole set. These lengths include the length of the needle tips. There are 8 end caps, 2 cord keys, and a vinyl case for storing all the parts. Knit Picks’ wooden needle points are sharp and tapered. They have the right combination of grip and slick. The wood is warm and comfortable in the hands, with just the perfect smoothness for slipping and holding stitches. The cables are flexible and memory-free. Whether you’re creating magic loops or working on decreases, they won’t be so tough with these pointy wands. The needles and cable are joined by a screw-like connection which you can tighten using the attached key. Plus, there’s a bonus – the needles have tiny holes to thread the lifeline through while you knit. Knitters know just how useful these tiny holes are in saving their work, not to mention their sanity and composure. Accidents do happen – a stitch suddenly falls off threatening to unravel a whole lacework – and this interchangeable knitting needles lifeline helps to lessen the rework needed. If you do a lot of socks, lace, or other fine knitting projects, you’ll need much smaller needles with finer tips than this set provides. Socks will also need shorter cables. The joins are smooth but need to be retightened every now and then. Since wood breaks more easily than bamboo, expect more accidents with this set than with the Clover bamboo set. Here’s another brand of steel interchangeable needles. A set includes 6 pairs of 5-inch steel needle tips in sizes from 9 through 15 (US sizing), and 4 cables (18”, 26”, 34”, and 42”). It comes with a rubber tightening pad which you use to grip needles with. We admit that the first thing we noticed in this Hiya Hiya set was its pretty and pretentious case. But we were in for a big surprise – there was nothing pretentious about what it held inside. The needle tips are workhorses in knitting. They’re sleek and sharp. In fact, yarns would fly if you had the speed. Unlike nickel-coated metals, they will not peel off with use. The cable does not twist or turn. Nowhere does it say that it’s memory-less, but that’s exactly what it is. It is made of a very flexible piece with metallic nuts on both ends. The nuts match the external threads on the base of the needles. The resulting join is secure, smooth, and snag-free. You won’t ever need to worry about your needle and cable separating while you’re in the middle of a project. Since this is a large-size set, it won’t be the perfect interchangeable knitting needles for fine knitting or lacework. The cables in this set are exclusively interchangeable with large needles and not with small needles, even those from this same brand. You may check out Hiya Hiya’s small-size sets or fixed circulars as they’d have the same quality but have specs that might suit your needs better. We can’t stress enough how important it is to choose a set that responds to what you need most as a knitter. It’s about how your hands feel about the needles, how long or short most of your projects are, and all other aspects that describe you as a knitter. While you’re being subjective about what you need, you have to be objective when reading product descriptions by suppliers and manufacturers. Look for interchangeable knitting needle comparisons. Read reviews. Skim through the sales pitch and screen important information from customers’ rants. We hope this article has helped you make an enlightened decision before you buy your new set of interchangeable knitting needles. The Clover Takumi Interchangeable set is my favorite. I prefer natural bamboo for flexibility rather than resin-impregnated or carbonized bamboo. I use two bits of rubber jar grip to screw my tips into the cables. They don’t normally come unscrewed or come undone while I’m knitting. On any sets with screw joins, just don’t torque the cables by overloading them with tight or too many stitches. I agree, I have a few sets from Knit Picks, , the joints on some sizes snag my work. I do have a set of Addi Cubix which I do like, but the Takumi set has the thinnest and most flexible cable which I love, and the I love the feel of the bamboo needles. FYI: Quality is huge in the decisionmaking process for these sets. The KnitPicks needles are…frankly….garbage. The cables routinely break off of their caps. Yes, they’re cheaper, but trust me, that won’t matter to you when you have 300 stitches of intricate lace unravelling in your lap. Thank you; you just helped me eliminate one option! Great point. Thank you for your honest review. Thank you from me as well. I am debating the ChiaoGoo full set because I hear that the cables truly have no memory. This is incredibly clear, succinct, and helpful. Thanks!